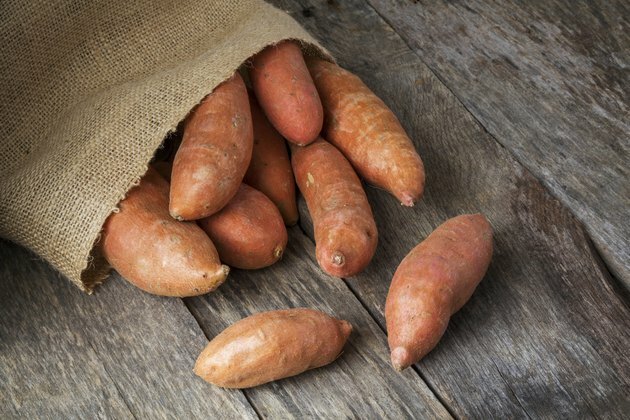 Are Sweet Potatoes or Yams Good for Blood Sugar? You may be surprised to find out there is no relationship between sweet potatoes and yams. Although often confused, yams relate closer to lilies and grass than to sweet potatoes, and sweet potatoes are more like the morning glory flower. It is no wonder then that these two veggies can affect your blood sugar differently. When you try to determine how a certain food will affect your blood sugar, consider its glycemic index value. The glycemic index is a method to determine how a food will raise your blood glucose. Foods receive a score that compares their effect to pure glucose. Scores range from zero to 100, the higher the score, the larger and more rapid the effect. Yams and sweet potatoes are quite similar in carbohydrates and fiber content. One 4 oz. serving of yams contains 27 g of carbohydrates with 4 g from fiber and 0.5 g from sugars. A half-cup serving of sweet potatoes contains 21 g of carbs and 3 g of fiber, but 8 g of sugars. This combination of carbs, fiber and sugars helps determine how the food will affect your blood sugar. The Glycemic Index rates the impact of starches on your blood sugar levels. Raw food contains starch stored in compact granules, which makes it difficult to digest. Cooking releases the starch and makes it easier to digest -- and to elevate your blood sugar levels. Foods with a low GI rating, from zero to 55, contain slowly digested starches. A moderate GI index rating is 56 to 69. A high GI rating, between 70 and 100, indicates foods containing quickly digested starches, the ones that cause blood sugar spikes and crashes. According to the University of Sydney, depending on preparation, the GI ratings for sweet potatoes are 44 to 94, while yams rank 35 to 77. The lower ratings apply to one-cup servings of boiled sweet potatoes, which rate 44, and one-cup servings of boiled yams, which rank 35. The highest GI rating of 94 applies to sweet potatoes peeled and baked for 45 minutes. Yams peeled and roasted on preheated charcoal get a high rating of 77. All of this information should lead you to believe that both yams and sweet potatoes are good for your blood sugar. Although yams have a markedly lower glycemic rating than sweet potatoes, both can be in a diet aimed at controlling blood sugar. Diabetics should have special concern with how foods affect blood sugar because part of diabetes is controlling your glucose. The American Diabetes Association recommends that diabetics eat between 45 to 60 grams of carbohydrates per meal. Either a sweet potato or a yam would fit into eating according to the glycemic index or a carbohydrate-counting diet for diabetics. Library of Congress: What is the Difference Between Sweet Potatoes and Yams? Are Sweet Potatoes Good for Diabetics? Which Foods & Vegetables Contain Starch?